He [Cameron] is a Navy corpsman (medic) attached to the 1st Combat Engineering Battalion of the 1st Marine Division. 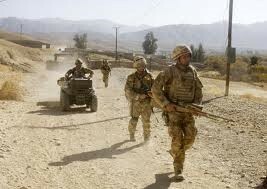 Their mission was to clear roadside bombs in Helmand province. He was shot in the right arm by an enemy round on March 28, 2011. (His 24th birthday was the next day). The Marine Captain reported to me that he was calm and focused and was able to direct the troops in how to stabilize his arm for transport. It took nearly a week for him to travel back to his home base hospital (Camp Pendleton, CA–Balboa hospital) arriving April 3. The orthopedic surgeons repaired his shattered upper arm using bone grafts from his hip. He is scheduled for surgery on his ulnar nerve and possible skin grafts before they release him for 30 day convalescent leave about the first week of May. Many have been praying from the beginning because Colleen has made frequent postings on facebook. We (Colleen, our twin 13yr old girls and I) are driving down to be with him next week. He has a couple of surgeries and he wants us to be there when they award him his purple heart. Our older son, Austin, was able to get emergency leave from his Navy duty in Djibuoti to be with him the first couple of weeks but goes back Wed., April 13.